Baking soda has very surprising advantages! Baking soda can be found in almost every home and has very interesting advantages. But not only for baking! Baking soda can be good for your health, is an efficient cleaning agent and a great ally for perfect skin. Here are 15 ways it can be used that everyone should know about. Are your peas and beans still too hard even after being boiled for hours? Add some baking soda to the cooking water and they will become soft very quickly. If your jewelry has lost its luster, baking soda can bring it back. Rub a mixture of baking soda and water on your rings and necklaces to get them sparkling again! Brushing your teeth with a paste made of baking soda and water every other day will make them whiter than ever. Baking soda can relieve the pain caused by a dental abscess until your dentist appointment. If your refrigerator smells bad, simply place a bowl of baking soda in it for a few days. Some packaging provided for this purpose is available on the market. If you're suffering from a sunburn, all you need to do is apply a paste of baking soda and water to the affected area. Let the remedy work during the night to put an end to the itching. Gargle with a mixture of baking soda and water to destroy the bacteria in your mouth that creates bad breath and eliminate it. If you have rough skin on your feet or elbows, simply rub some baking soda onto them. Rub baking soda and water on clothes with stubborn stains to easily remove them. Whenever you suffer from heartburn, simply add a teaspoon (15 g) of baking soda in a glass of water and drink the mixture. Baking soda is the perfect scrub that can remove dirt from your face and rid it of blackheads, wrinkles and acne. Regular use will make your skin soft and smooth. Add a little baking soda in your shampoo or wash your hair with a mixture of baking soda and water to give it more volume and a beautiful shine. 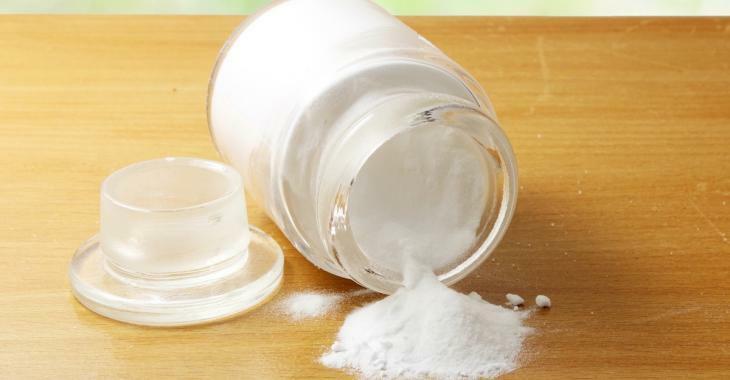 To relieve pain, swelling and irritation from bug bites, rub some baking soda and water on your skin. Instead of using commercial deodorants that are often full of chemicals, dab a little baking soda and water on your armpits.